So much to review so little time. Remember last week I mentioned how I bought a few different chocolate bars at Trader Joe’s and I was going to do a triptych of reviews? I’ll get to them – I swear – just not this week. And before I go into this week’s review – can I rant about sugar alcohols? Last week’s review was for a “sugar free” chocolate …oh except that it was made with sugar alcohols, that have 75-90% of whatever makes sugar, sugar. As opposed to the 100% of whatever makes sugar, sugar. Call me a stickler for clear communications but if you call yourselves SUGAR FREE, shouldn’t you NOT have anything in you that’s sugarish? If I was weird and wanted a beer but didn’t want to get drunk, and you sold me one that said “alcohol free” but really you meant it had 75-90% of whatever makes alcohol, alcohol – then I’d sue you. I love being litigious. 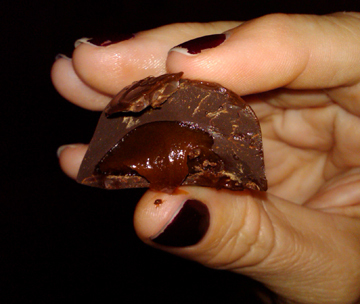 It’s 4 dark chocolate domes with caramel inside that are attached to each other at the base. It’s a dark caramel, and they probably should have just called it ‘fudge’ because it tasted and felt fudgey. There is also a whisper of coffee in there, and no I didn’t just make that up. The packaging uses that ridiculous description. On first dome, I didn’t taste it at all but on my 2nd dome…I confess the tinge of coffee was clear and although I curse myself for even typing the word w-h-i-s-p-e-r again to describe the taste… it’s true – it really was just an f-ing whisper of it. 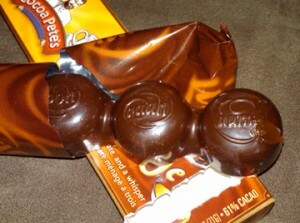 The other really nice thing about these were the consistency of the chocolate domes. They were thick but not so thick that you had to clamp down on them like a bear trap. I’m not fond of the ‘gotta-bite-hard-but-watch-out-for-the-spurts-o-stuff’ chocolate bar. A lot of fancy shmancy truffles are like this. These also weren’t like a Cadbury Caramel bar, which when you bite, it gets everywhere and falls apart on you. These didn’t fall apart. I could freely take a bit of the dome, keep the other half dome in my hands, and there was no undo pressure to gobble the whole thing down before it got all over my shirt. +1 for ease. I also liked the amount. I could have easily eaten 4 cuz I’m a fat pig but sharing 2 of them with my better half was fine and we both felt like we got our chocolate fix. My only real problem with these is the packaging. I’ve ranted before about this, I know. Who legislated that good, and especially specialized fancy candies have to have olde time fonts? I didn’t get the memo. Let me throw out a suggestion: how about broadening the marketable universe by creating a package that is tripped out and cool looking; one that appeals to anyone between the ages of say…13- 65 as opposed to just 50-65. I’m no marketing whiz (wait – I am) but I gonna bet you could increase sales 10-15% with some cool art and a little less of Chef Pete with his ‘i-play-dixieland-music-in-tomorrowland’ grin on his face. Just a hunch. 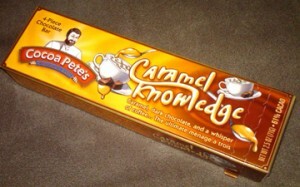 But Pete’s candy = yummsville. Visit Cocoa Pete here and buy something. I love your nail polish, Matty. I shaved my fingers too because I didn’t want the hobbit hair to get in the way of the deep maroooon.